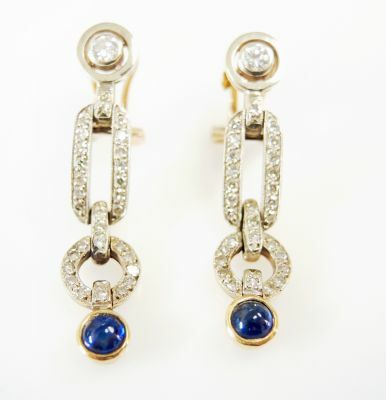 A wonderful pair of Art Deco inspired 14kt yellow and white gold drop earrings, circa 1980's, featuring 2 round cabochon deep blue sapphires, est. 0.95ct; 2 round brilliant cut diamonds, est. 0.20ct (clarity: SI2-I1 & G-H colour) and 58 single cut diamonds, est. 0.58ct (clarity:SI & J-K colour).